Of COURSE wifi isn’t safe! If a 12 year old child can demonstrate the damaging effects of Wifi with a handful of cress seeds, why do ‘scientifically knowledgeable’ adults think it’s safe? Because they are not DOING any SCIENCE to find out! We simply believe what we read and are too lazy and trusting to do simple experiments that prove the opposite. 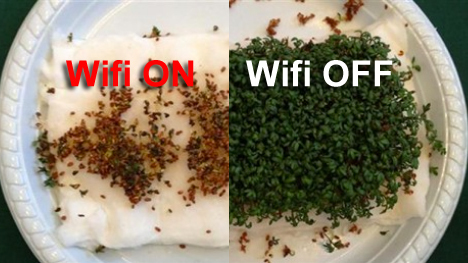 The above image shows the blindingly obvious effect of exposing cress seeds to microwave radiation from a home internet, wifi enabled router for a few days. Now just consider what that might mean for the brain development of your unborn child as its cells divide and multiply, while its pregnant mother rests her wifi enabled tablet on her belly to enjoy hours of social media. I don’t know what the ramifications are. But I do know that microwave weapons expert Barrie Trower says the eggs in the ovaries of our children, are ten times more vulnerable to microwave radiation than any other tissue. So it is not our generation we should worry about, or even our children’s. The genetic mutations we may be causing now are most likely to show up in our yet to be conceived grandchildren. The Russians, the Chinese and the Iranians have not been fooled by the telecom lobby. Instead they have listen to their scientists. Their exposure is a fraction of ours, and Chinese women wear protective clothing when pregnant. Here in the West, we have put our heads in the sand and taken the exquisitely ignorant position of claiming that microwave radiation is safe, despite all the evidence to the contrary. So we are left with the brain-washed mantra “Wifi is SAFE! You are wrong. And to hell with our children’s reproduction and genetic mutation in our grandchildren! I recommend to everyone who will listen, that they do what I do, and use cable for internet connection. You can use ‘Homeplug’ if you don’t want some many wires around the house. And if all else fails, switch the router off at night! One last comment. Look again at the seeds. Do you think a little fertilizer would fix this? Then why are you trying to fix your health with supplements if you haven’t addressed your microwave radiation exposure? Here is the cress seed article.